The New Tree House is a nice Restaurant and offer accommodation on a perfect Bay with a beautiful tropical beach on Koh Chang’s East Coast in Thailand. The small and simple Bamboo huts are really cheap and a perfect choose for Backpackers and Travelers. Here on Long Beach is nothing, just the New TreeHouse, the Gulf of Thailand, a white paradise Beach, cosy Bungalows and nice people from around the World on their Travel Tours through South East Asia. The menu of The TreeHouse Restaurant on Koh Chang offer Yummies Thai and Falang food for a good price. The dishes are huge here at TreeHouse, so the right choice after Traveling. My favorite are the delicious Fruit shakes. The best way to come here for a day trip is by Motorbike, if you are a good driver. The streets from Salak Phet and Long Beach are not that developed than in Europe or the Main road of Koh Chang but still it is possible to come here. The street is ok when you have a strong Motorbike or drive alone. If you want to stay here you can take a taxi from the TreeHouse on Lonely Beach which leaves in the morning or make a deal with a taxi driver of the “normal taxis”. The Treehouse on Ko Chang is a good option for Travelers or Tourists who looking for a cosy beach hut direct on the sea surrounded of a quiet bay with a perfect beach in Thailand. how can i get their phone number?? 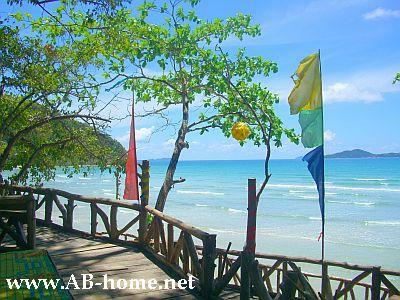 I would like to book 3 bungalows for 2 weeks from the 30th of january to the 10th of february if you have it avaliable. Very important : I would like to know if any mobile network is avaliable / in range of your bungalows? If so, whitch Thai mobile phone provider reach your Bungalows? If so, can we have hire at least one of these bungalows? Maybe you have an interne on the spot? If not how far is the closest avaliable mobile network and/or internet?. Stayed at Tree House / Long Beach in January. Cheap and simple huts are terribly neglected, beach not being cleaned, lots of rubbish. 9 o’clock taxi in the morning might leave at 10.15 without excuse or explanation, (driven by a drunken French boy, which explains).